Tempeh has become a new staple at our house. It’s cheap, easy to cook, and a great meat substitute. After my kids asked me to cook more vegetarian meals, I have been searching for alternative sources of protein. I haven’t been able to get the kids fully on board with tofu, but tempe was a much easier sell. I think the firm, meaty texture is a bit more familiar, and it tends to soak up the flavor of sauces nicely. I tried this recipe on a few new Tiny Tasters today, with some great reviews overall. The udon noodles are soft, chewy and familiar and the sauce is a bit salty and sweet. Most of the kids enjoyed all the veggies, too. 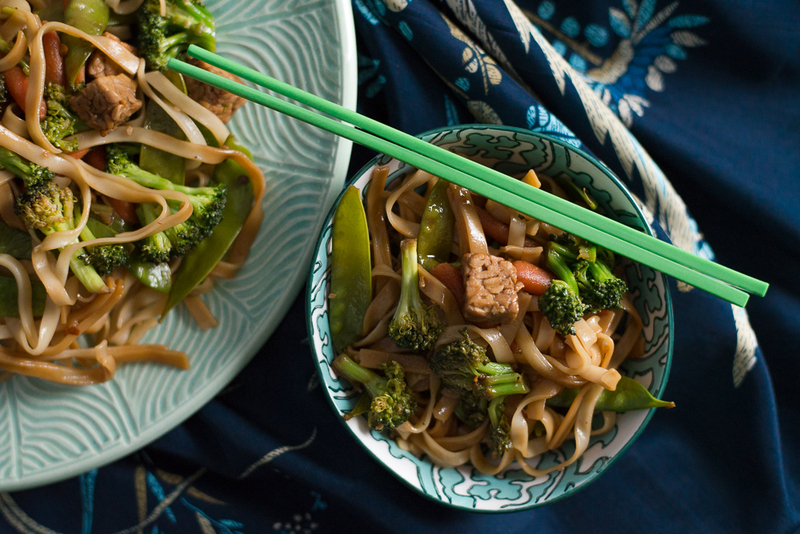 There is a lot of room to customize this recipe and add in your favorite stir-fry vegetables. Whisk the first 7 ingredients in a bowl. Add the tempeh and stir to coat. Marinate the tempeh for about 10-15 minutes while prepping veggies. Boil water for the noodles in a medium-sized pot. Heat vegetable oil in a large stir-fry pan. Remove tempeh from the marinade with a slotted spoon and cook in the stir-fry pan until slightly browned, about 3-4 minutes. Add veggies and about half of the tempeh marinade. At this point begin boiling your udon noodles in the pot for about 4 minutes or according to package instructions. Continue to cook veggies for about 3-4 minutes. Drain udon noodles and add to stir fry pan with the remaining marinade. Cook an additional 2 minutes while stirring marinade into the noodles.